Do You Struggle With: Slow Times, Wide Turns, Shouldering, Tipped Barrels, Lack of Rate, or other Barrel Horse Training Problems? Are you looking to give your young barrel horse the best start possible? Are you pulling your hair out because your barrel horse isn’t fast enough or is making mistakes that cost you money? Are you sick and tired of going to a barrel race only to be just out of the money or to have tipped a barrel to win? My name is Michelle Davey, better known as The Drill Queen by those that have been to my barrel racing clinics or have come to my home for barrel racing lessons. Like many aspiring barrel racers I have struggled looking for that “magic bullet” that would help me improve my times and have wicked fast barrel racing runs. I have made the mistakes, and wished I could have that horse back. I have been to the clinics, had private lessons with NFR qualifiers working towards finding that magic clue. I’ve found training stategies along the way and I look forward to sharing them with you. This is a great resource for every barrel racer at any level. Michelle has done her research and has found an endless amount of info. I really like how it is a “recipe book” to find what you are needing at that time. It is very well laid out and very user friendly. I have suggested to many people to use this site for reference to problems they are having. I coach a girls college rodeo team and have encouraged all the girls to use this site. The barrel racing drills on this site are a compilation of years and years of riding and studying barrel racing horses. I started a binder when I was just 14 to remember the drills we did in the clinics I went to. I’ve been adding to it year after year. Regardless of whether a particular drill applied to the horse I was riding at the time, I would write down these drills to help me remember them for a future horse. Michelle & Jet making a winning run. over my little black binder of solutions. I mean really…..maybe this was the ticket to my next big win! Should I be sharing it!? Years later, while preparing for my first barrel racing clinic that I instructed, I put together a booklet of some of my favorite drills. They were the ones we’d cover in the clinic and a few bonuses. The feed back was fantastic so it spurred me to get going and put together a collection of drills for an ebook. I had something that could really help others. I had the ebook done and was working on how to present it to other barrel racers. It came to me that I should have it searchable by problem so that if you are having a problem you can just click on it and it will bring up all the drills that will help the user fix the problem. The site is very user friendly. Very easy to make your way around the site. I like how there are pictures as well as an explanation. That helps to make things more understandable. So if you horse is “shouldering” or you have “no rate” you can click the appropriate section and it will take you right to those problems. I’ve been there, I’ve had the problems and I think this will be an invaluable “problem solving” type of resource for you. You won’t just solve the problems, but learn drills to avoid them too. I’m so excited to share these drills with you. I use them a lot when I’m working on a problem horse or training a new one. The basic foundation drills right up to the more complex and drills you’d do at quicker speeds, they are all just so useful. While putting this “web book” together I’d find myself heading out to ride and use some of the drills I had tucked away for “safe keeping”. It’s now even a great resource and reminder for me and I put it all together! Sometimes we just need a little reminder too! My horses stay happy and interested and I find they are more broke and waiting to do whatever I ask because of these drills that I use….and the pros use them too! I’ve put together over 80 drills and exercises you can use to help train and correct problems with your barrel horse. You will also receive access to a diagram for each drill to help you succeed. Work on your horses mindset by using this drill and exercise program to stay off the barrel pattern. Build Softness laterally and vertically by working serpentine, side passing and half pass drills. This site is chalked full of all the drills and exercises you need to improve your barrel racing times. Some riders starting out have shaved SECONDS off their times just from working these drills. TENTHS might be what you are looking for, but my students and I have shaved SECONDS by tackling some big problems. Target your horse’s weak points with the drills specific to your concerns and see the difference. 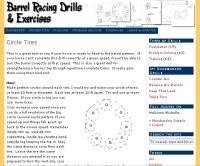 Barrel Racing Drills is the most comprehensive website as far as training/drills I’ve ever experienced. Michelle Is able to target and fix specific problems through specific drills that keep your horse honest and working correctly. I would recommend this site to anyone looking to improve their barrel racing. You will receive instant access to all the drills. Your username and password will be all you need to access this information 24 hrs a day, 7 days a week for 365 days! This is a one time fee for continuous access to the drills for a full year. Start training and perfecting your barrel racing skills instantly! You can even print the drills and bring them with you to the arena – make your own binder if you’d like. And its not just access to these 80+ drills you’ll get either. You will also receive 2 bonus items valued at over $80! A free report worth $35 or more. It contains the 10 essential maneuvers every barrel horse (or barrel horse prospect) should be able to do before heading to the barrel pattern. Save yourself time and money by making sure your horse has these moves down first. So many head to the pattern and miss these essential steps. Put them in your program now and get ahead! If you’ve ever had to mark a pattern and were totally lost, this guide is really priceless! Anyone in their right mind would pay $45 for it. Big patterns, small patterns, angled patterns; this guide will walk you through it all. A handy reference that comes with a scoreline cheat sheet too. I am really enjoying your site, I have gone to a few clinics and learned certain drills, but it is nice to find everything in one place. If you are not completely satisfied that our barrel racing drills offer you sound solutions to your barrel racing problems, simply contact us for a full refund at any time during the first 30 days. We are proud to offer you a no-hassle guarantee. Remember, I’m so confident that you will find these drills to improve your times, smooth out your runs and improve your horsemanship, I’ve staked my reputation on it. I absolutely insist that you send your pass back to me for a full refund if you don’t think these drills and exercises are right for you and your horse! Don’t get me wrong, you’ll still get the value later (our most common feedback is that people would pay much more for this once they see what it is!). Why not save some cash while you can though? If you’ve decided now is the time to look forward to better runs and faster times, I’m excited to help you with that journey. For only $37 CDN you can be on your way. Plus, you’ll be headed there with your 2 free bonuses worth over $80! Click Here if you would like to access a printable form you can fax or mail to us for payment and access. Remember, if you aren’t thrilled with what the access pass presents, you have 30 days to ask for a full, no questions asked money back refund. And you get to keep the $80 in bonus materials! I’m looking forward to hearing of your success – let’s stay in touch. PS. Barrel Racing is a competitive event, and I assure you these drills will give you a competitive advantage. Can you afford to go to barrel races where your competitors are doing these exercises and you aren’t? Don’t waste another run without having a zero risk look at these solutions to many common barrel horse problems. I can’t promise you that you will be the greatest barrel racer known to man. I don’t know how much time you are willing to commit. What I can promise you is that by doing these drills and exercises you and your horse will be more competitive. You and your horse will both be happier and you will improve your barrel racing times! Seriously – for less than it will cost you to get to the next barrel race you will receive hundreds of hours of my work and riding at your fingertips. Plus the free bonuses! 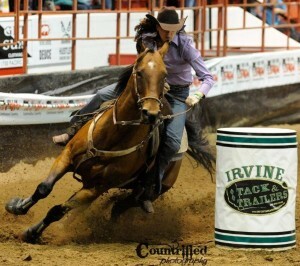 I’ve gone to great lengths to help you become a better barrel racer, the rest is up to you…..